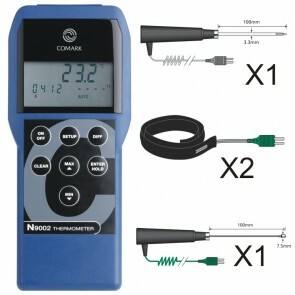 Thermometers and kits designed to test heating, ventilating and air conditioning. 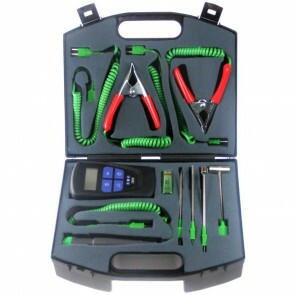 Heating system thermometers are ideal for ensuring a central heating system is operating efficiently. If a system is heating too much in certain areas it will simply be a waste of money, too little can result in condensation and mould growth. Our thermometer range are aimed at both the home user and professional HVAC engineers. One of the best ways to ensure a system is working correctly is to balance the radiators. The radiators in a feed and return central heating system will tend to operate at different temperatures depending upon where on the system they are sited. Those nearest to the boiler/pump are likely to be warmer than those further along the system. To prevent this disparity, radiators are fitted with a lockshield valve at one end of the radiator (where the pipe connects with the radiator). A lockshield is designed to even out the flow of water through each radiator so that with the system in its normal operating condition, the temperature drop across each radiator is about 12°C (20°F). It is quite a simple process to carry out and once done should not need to be done again unless pipework or radiators are changed. The easiest way to measure the temperature drop across the radiators is to use a pair of radiator thermometers or pipe thermometers - one on the radiator's inlet pipe, the other on the outlet pipe. 1. Switch off the central heating system and allow it to cool. 2. On every radiator in the system - using a small adjustable spanner open the lockshield valve and control valve. The control valve is at the opposite and of the radiator. 3. Locate the radiator nearest to the boiler and then attach radiator thermometers to the INLET and OUTLET pipes. 4. Switch on the central heating system. 5. Turn the lockshield valve until it is nearly closed. The temperature of the system will begin to rise and as it does so gradually open up the valve until the difference in temperature readings of the two pipe thermometers is approximately 12°C. 6. Locate the next radiator on the system and again close the lockshield valve and adjust it until the temperature difference increases to about 12°C. 7. Continue along the system until all radiators have been balanced. Note: If the room temperature is too high, the heat emitted by a radiator will be less than intended by the design, and so the temperature drop across each radiator will be less than 12°C. If balancing on a hot summer's day, you will need to use a lower temperature difference.